Grind fruit in the order given through coarse blade of food chopper. Stir in nuts, sugar, spice and bourbon. Spoon into jars; cover. Store in cool, dry place.–Yields about 3 quarts. 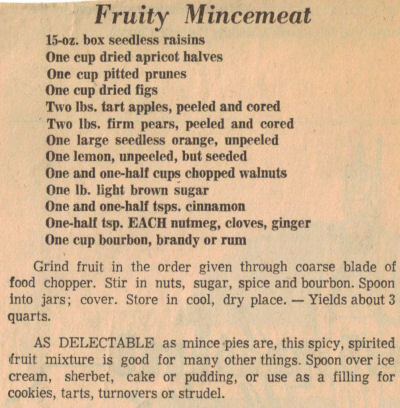 AS DELECTABLE as mince pies are, this spicy, spirited fruit mixture is good for many other things. Spoon over ice cream, sherbet, cake or pudding, or use as a filling for cookies, tarts, turnovers or strudel.